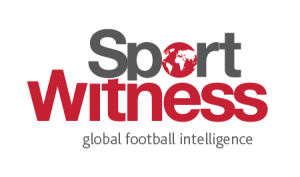 It was pretty obvious that the claims saying Adrien Silva has been negotiating his return to Sporting would end up in some controversy. 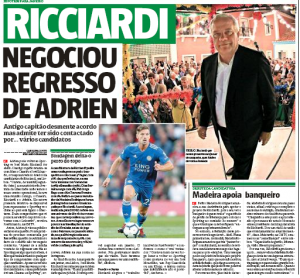 Portuguese newspaper Record started the story on Tuesday, saying that José Maria Ricciardi, who’s running to be Sporting’s new president, would be in talks to take the player from Leicester City. Then things got more intense last night, when the candidate spoke to CMTV confirming the talks for the midfielder. “I confirm that only the negotiation with Leicester is lacking. If we win, Adrien will come to Sporting in January,” he told CMTV (via Correio da Manhã). 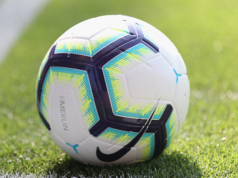 Following the news that came to the public in the last hours, I hereby state that despite my desire to return to Sporting one day, to be something everyone knows, it’s false that I had made any kind of commitment to any candidate. Although I have been contacted several times by several candidates, my President is only one, his name is Sporting. As a Sportinguista I always want the best for my club and whoever is the winner will have all my support, respect and affection, as I am sure he wants the best for our club. At this moment I defend the colors of Leicester City and this is where I am focused and give my best. Sporting CP are my Club from the heart and the one I always defend and support during my life. I am made of Sporting! A good luck hug for all the candidates and bring the best to our club. After the strong statement, Ricciardi had a step back and only claimed that Adrien is a possibility for the January market. These quotes are brought by Record: “It’s a possibility I already said. It will only be possible to negotiate in January. However, Ricciardi’s team couldn’t hold their horses. 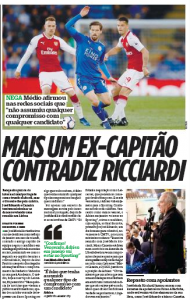 Newspaper O Jogo managed to interview Marco Caneira, who would be one of the men who have been negotiating with Adrien. He claimed that the midfielder is only protecting his status as a Leicester City player, but is indeed committed to returning to Sporting. After all this mess, we wonder if Adrien is still keen on honouring his agreement with these guys even if he has one. It’s obvious that they’re leaking this to win the elections on Saturday, but they are clearly messing with the player’s image at Leicester City.